The most urgent toxin of all is background tropospheric ozone. Ozone causes cancer, emphysema, asthma, and diabetes. Ozone reduces annual crop yields by billions of dollars by stunting growth and seed production, and is killing trees that are damaged by cumulative exposure year after year. http://witsendnj.blogspot.com/p/basic-premise.html has a more complete explanation of this existential threat. I would love to see mothers become a powerful force in the debate about climate change. But no matter how many eco-products we buy, we all share the same atmosphere. We are filling it with poison by burning fuel. We should ration dirty energy and restrict its use to only the most essential purposes while we transition to clean sources. A habitable climate for our children is at risk. Lytle Creek is a watershed for the San Bernardino Inland Empire. In 1988 The Santa Ana Regional Water Quality Control Board found over 100,000 time the permissible levels of lead contamination at the surface. In July 2010 the SB Sun a local newspaper published that SB ranks 5th highest in lead poisoning.Even though an abatement notice was issues to the governmental agency responsible, there claim of categorical exemption still stand and all local city managers refuse to move forward on this critical issue, In fact I possess a letter from Congress Joe Baca that asserts no problem,yet every rainfall more lead finds its way into the populations water intakes as evidenced by PB violations at the tap. Sice neither Barbara Boxer nor Joe BAca will help what can the poor urban monority population do? In over 20 years attempting to have this contamination eliminated I have failed miserably. I had not heard of the term “ecomom,” and I’m not a mom yet, but that’s a much better descriptor of what I hope to be. Way before it was trendy, my mom (and dad) set a good example of being ecologically conscious, partly due to frugality, which contributed to my development into a highly eco-conscious adult. Didn’t know if you’d seen this. It would be great to see which manufacturers are using renewable energy to create their products. This also shows their commitment level to a greener ecosystem. The average citizen and small business should be able to receive their own “clean power” directly from the sun -not from a utility company. First of all — Go Eco-Moms, Eco-Dads, Eco-Americans! You rock! Secondly, we are facing a huge challenge when the new Congress is sworn in. The GOP is planning dozens of hearings to put the EPA and Obama administration on defense when it comes to promoting clean air, clean water, and clean energy. If we want a safer, healthier, greener planet, we have to vote with our wallets, but also with our voices and we have to make it as uncomfortable as possible for those who would weaken our environmental protections. In an effort to give dads credit where credit is due, perhaps we should avoid the stereotypical titles given only to mothers, and appropriately use a more-inclusive term such as Eco Parents. I don’t believe in the global warming idea, but I am gravely concerned about all the chemicals in our environment. As a mother, I want all products to be safe for my children. Thank you! I hate to break it to you, but you really don’t have a story here, because the Tea Party and Ecology aren’t inherently oppositional to each other. At their best, both groups advocate for a return to self-sufficiency, local influence, and local choice. There are TONS of people, including myself, who consider themselves advocates for both civil rights and safety of the environment. 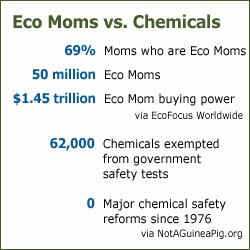 The Tea Party doesn’t fully represent me, but certainly neither does the status quo “Eco-Mom” label. Both have strengths and weaknesses of philosophy. The Tea Party is my hope for a return to civil rights in America based on our Constitution and localized government where everyone has a voice. The Ecological movement is my hope for a world where we return to greater self-sufficiency, buy local, and take responsibility for our trash. They really aren’t that different at the core and it’s simplistic to assume everyone is one or the other. See http://switchboard.nrdc.org/blogs/drosenberg/urgent_call_now–ban_on_bpa_in.html#comments. URGENT: Call your Senators now – Ban on BPA in baby products back in play. November 18, 2010. You should be aware that the Obama administration is doing a good enough job on it’s own of threatening the environment – it doesn’t require any help to accomplish this from the GOP. Please do your research the next time before assuming campaign speeches will translate to actions. Obama has put a record number of Monsanto cronies into the Dept. of Ag., under his leadership S510 just passed, which will make it virtually impossible for small farmers to operate. Some are calling this bill a death threat to the small farmer. Monsanto is the leading producer of agricultural pesticides and pollutants and is very tight with Vilsack, Obama’s pick for Ag Czar. I am from Iowa and know that Vilsack used to fly around the state on planes provided by Monsanto when he was governor. Obama has picked for his Science Czar a man who wrote a book which advocated population control by poisoning public water. Not kidding, it is on Amazon. Obama has bailed out the auto industry at the expense of the rest of the economy, which threatens innovation as it makes it more difficult for green autos manufacturers to arise and compete with these gov’t. supported old dogs like Chrysler. Obama also chose to turn down the help of 14 nations to help clean up the oil spill, including the Dutch, who have developed the best oil spill containment technology around, leading to the massive death toll of aquatic life in the gulf. I vote independent and voted for Cynthia McKinley. But whoever you vote for, please do a little research before assuming anyone is or will walk their talk. Both the Democrat and Republican sides are virtually identical when it comes to putting big business first. Please don’t be naive. Aloha and great article!Love the term ‘green tea party”!Count me as one more eco mama! 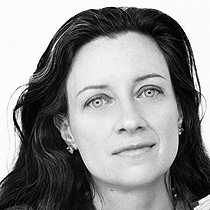 I follow Dominique Browning’s column and have been a long time supporter of EDF, NRDC, Union of Concerned Scientists and more. That involvement began for me in 1975. So when Dominique says, “Ten years ago, there was usually one choice: go to a health food store and look for Seventh Generation,” I need to add some information. Actually, 50 years ago there was a company whose mission was, and still is, “In Harmony With Nature.” Their all-purpose cleaning product is concentrated and non-toxic, as are all of their Get Clean household products. This all purpose product has been available for 50 years… not 10 or 5 or 2… but 50 years. We’ve used it for 35 years and now our adult children are using it in their homes. The company is Shaklee and the product is Basic-H. Their Get Clean household product line is safe, non-toxic, and works wonders. I’m sorry, I just had to have this company, whose founder was way ahead of his time, acknowledged for the good they continue to do. They were the first Climate Neutral Certified company in the world – back in the year 2000. Now THAT was 10 years ago. They have walked the walk from the beginning. Thank you for all of your efforts. United we can do much. Unfortunately, schools don’t always accommodate our desire to raise our kids “green” — they forbid you to send your child to school with a metal spoon or Pyrex container, forcing you to use plastics. They require us to purchase plastic baggies and wet wipes among the “school supplies” children are required to bring to the classroom. We are embedded in a culture of waste; our individual efforts to stem the tide get lost in the universal expectation that everything should be instant, disposable, and individually wrapped. Hey, ho. Dominique. You forgot eco-grandmothers. My granddaughter is why I started to fight against toxic chemicals in the environment. I love the concept of eco-moms and the Green Tea Party. You are right. We have power. Together, hopefully we can make a difference. I love this! Oh the power of a woman, let alone many women!